This entry was posted in Crowdfunding IndieGoGo J.U.L.I.A. on October 8, 2013 by Jan. In my last chapter I explained my thought process behind the overall money situation and pitfalls you might encounter while trying to come up with a realistic target for a crowd sourced project. Today I will reveal my mind set behind creating a set of pledges and perks. Please keep in mind, that this is one of the most important tasks in the course of preparing your campaign because nothing can drive potential backers off more than incomprehensible or imbalanced perks. Before you publish, it’s critical to share your proposed incentives with your friends to get their reaction. A pair of fresh eyes will always bring you a more objective perspective. Whatever crowdfunding purists might say, from my experience, the vast majority of backers perceive crowdfunding as a preorder. And of course every single backer takes an amazing leap of faith with their “pledge” because they risk under-performance or even complete failure of the project. So just imagine asking for pledges where the reward is only a thank you email and a recommendation to buy the finished game in the store. The question is – would you personally back such a project? 1. Is the pledge level motivating enough? 2. Could the pledge level ruin me if too many people pledged for that reward? 3. Does each pledge level fit in the overall scheme of pledges? 4. Are all the rewards perfectly clear and understandable? Of course this is by no means an exhaustive list and you will soon see that I came up with new ideas for our own campaign tiers, but you have to start somewhere. With pledge rewards it’s always a tradeoff between value and costs. For that reason the most “efficient” rewards are basic digital rewards because you avoid direct manufacturing and shipping / handling costs. Next would be digital personalized rewards because they only take a small amount of your additional time to satisfy – with the exception of high level personalized tiers of course. One of the most important considerations is balancing the pledge increment with direct costs. You probably won’t motivate people to support your project by charging $25 for wallpapers when your final game will be sold for $20. On the other hand you shouldn’t overdo what is included at any pledge level or risk having nothing left over or even worse – lose money after covering the cost of the reward. My helper spreadsheet (which you can download here) should help you keep this info pretty much organized and neat. Once again it’s filled with dummy numbers only to demonstrate how the system works. You need to do your own research to come up with realistic numbers from your local manufacturers. The important information is stored in rows 24, 25 and 26. Row 24 tells me how much will I pay for that pledge level. Row 25 tells me how much will be available after the direct cost deduction (see below about indirect costs). Row 26 tells me how much money is coupled with new rewards. This is very important information and I’ll give an example based upon the dummy table. If you compare level $50 with level $75, you immediately know that $25 (cell F26) equals to Poster and hardcopy of a hintbook. Using this method you can avoid mistakes stemming from unbalanced rewards to pledge level ratio. When you’re done with your spreadsheet, you should have a really good idea about the rewards you want to offer without “cheating” backers or getting ruined by incredible costs. I, for example, ruled out T-Shirts as the manufacturing costs were too much. However we had a lot of other things to offer so I didn’t feel we were short of rewards. And always stay realistic about what you offer. Unless you are a known industry figure, would it really be so awesome to have a dinner with you or have a tour of your living room where you, as a small indie, make your games? And pay $5,000 for that? Very often I see campaigns with such muddled rewards that I would need to some kind of matrix to find out what the heck I am going to get. Of course (like other potential backers) I close the page instead of wasting my time on this. Now before you fall for the trap of creating as many pledge levels as possible, there is one big problem – IndieGoGo is limited. You can only have up to 12 (!) 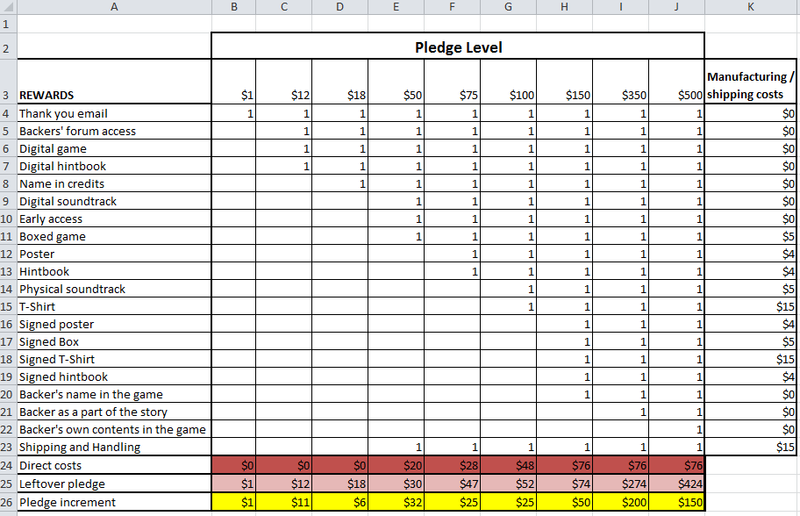 pledge levels for the whole campaign. And my strong advice is to not start with that maximum. I will be writing more about that later, but basically you want to keep the campaign alive and updated. One of the great devices to achieve this is by adding new pledge levels as the campaign continues. These should ideally arise from the real “expressed” interest of backers who are either not convinced to pledge yet or “would upgrade their pledge if”. Another great rule to keep is to try as much as possible to keep to an “incremental pledge structure”. This means that every higher pledge contains everything from the lower pledges. As soon as you start to throw in exclusions, it gets complicated for potential backers and once again if it is too complicated – you are going to lose them. Of course eventually your pledge rewards (as they evolve and expand) can get a bit muddled. That is fine as long as when the campaign launched they were absolutely clear and transparent. I also advise to put in limited Early Backer’s rewards (they are basically the same as a game only, but for a lower price) and for the high level tiers you absolutely have to use a limit! Imagine that you have a pledge reward to be featured as an in-game character and 10,000 people pledge for it. Your game scenes could get seriously jammed. Another advice about personalized digital rewards is that their significance should be proportional to money which are backers going to invest. 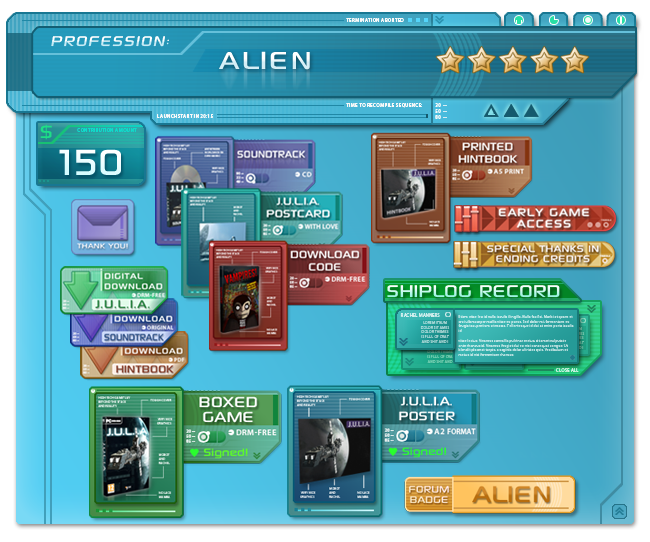 There is a significant difference between modifying one line of code to add a person to credits and between creating that person as a playable character in the game. Always think about the impact and visibility of the personalized reward and make it attractive to backers. I would for sure not back $5,000 just to see my name scribbled down on a piece of paper, deep down in a hidden corner of a cellar. Words are nice, but using images to detail pledge levels does a much better job. The images also make your campaign more dynamic and create a feeling that you really took care of the campaign. On the other hand the descriptions on the right side of the campaign should be really clear and to the point so backers can quickly discover their favorite level. When offering rewards, you should always advantage your team’s strengths. Does your team consist of real painters? Why not offer an original small oil painting by them to top tier backers! Are your musicians real professionals? They could compose a custom soundtrack for top-tier backers. The idea is that anything you can offer to high level pledges that really stands out from other projects is a real advantage. And creativity counts. Otherwise you risk being lost in the crowd of projects trying to get funded. Once again I have to warn you, though. Creating personalized rewards takes time and thought. Even if the costs are not direct, you have to add the time needed to deliver those rewards and if you pay your team, that work detracts from your budget. So – simply said – keep it reasonable. In our case our special rewards are music centered and as I am the musician, I don’t have a direct costs associated and moreover I love composing so it’s a win-win situation for me. I’ve also offered our other games (J.U.L.I.A. Untold and Vampires!) as additional rewards keeping the pledge levels attractive. If you are interested in how we did this, feel free to check our campaign and see how our pledge levels are structured. Please note that you won’t see the actual end number of total pledgers because of one of the worst IndieGoGo “mal-features”. It doesn’t summarize pledges so the end reality is totally different from the numbers you see there. But we will come to that later. If you need a reminder, our campaign is at http://igg.me/at/julia-enhanced. Thank you so much for reading this blog and please stay tuned for the next chapter dealing with the campaign launch preparation! Once again I’d like to invite you for a discussion about pledges and rewards right here in the comments. PS. If I can ask you to support our ongoing greenlight campaign, please spare 1 minute of your life by clicking on the image below and upvote us. We really appreciate that! It was an interesting read, although I[m not sure how many people not making a game/crowdfunding a project will be interested as well. It was nice to see your thought processes with the structure of the reward tiers. And yes, the relative cost for digital-only tiers is part of why I’m an advocate for them. If I’m supporting a project I believe in, I’d rather that you get as large a portion of that cash for the project itself as possible instead of it going to rewards. Thank you so much for your kind words! The focus of this series really lies on describing the process and potentially giving some tips to the others to start their own campaigns. While there are many articles about crowdfunding out there, I want to present some sort of a complete retrospective based upon my own experience. It also distracts me from working on J.U.L.I.A. (not really – we proceed faster than ever now).